A record breaking snow storm swept through Western Washington last week. Port Angeles received about 12 inches of snow in town. To the west, the snow levels were much deeper. 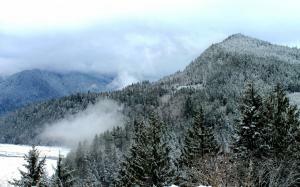 These photos were taken in the Elwha River Valley along Highway 101 about seven miles west of Port Angeles a day before the storm hit. The largest dam removal in United States history began on the Elwha River in the fall of 2011. When completed, the removal of the Elwha and Glines Canyon Dams will unleash seventy miles of free flowing water, allowing the estimated 3,000 salmon now spawning in a five mile area of the Upper Elwha to increase to 300,000. Scientists warn though that it could take thirty years for the river to return to its pre-dam flow of a century ago. In addition to bringing back the salmon population that once boasted every native Pacific species: Chinook, Coho, Chum, Pink and Sockeye as well as Steelhead, Cutthroat and Bull Trout, the dam removal will have a positive effect on the Lower Elwha Klallam Tribe, which has called the Elwha River Valley its home for literally thousands of years. The decrease in fish coming upriver had a significant impact on the tribe both financially and as a vital source of food. Additionally, when the dams were created, sacred spiritual and historical tribal sites were completely submerged underwater. Experts are hoping that the success of the Elwha and Glines Canyon Dam removals will be a catalyst for tearing down other aging, obsolete dams around the country. It's days like this which really make you appreciate the changing of the seasons. Located on Highway 101 between Port Angeles and Forks, Washington on the gorgeous Olympic Peninsula, Lake Crescent is a popular destination for tourists and locals alike. 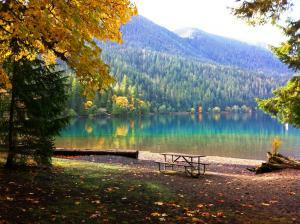 This picnic area is located in a small spot called Bovee's Meadow, just to the west of the historic Lake Crescent Lodge. In the 1940s, Walter and Bessie Bovee purchased the 1916 built Lodge reviving it and expanding the recreational offerings along the shore.